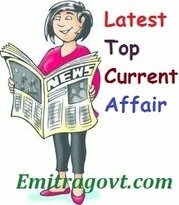 Current Affairs Question 2017: Looking for 31 August Current Affairs? Then start your Quiz right now by answering them. Here in this article, we are giving the Current Affairs Quiz with Questions and Answers. As many people are preparing for various government exams it became mandatory for them to get a grip over the current affairs as in most of the tests are based on Daily Current Affairs. By taking this kind of Current Affairs Quiz candidates can eventually get hold of what they have been working on. Contenders can trust us as we will update all the latest Current Affairs in this quiz. For more such quizzes check our site Emitragovt.com regularly as we will update the Daily Quiz for current affairs. 1. Defence Minister Arun Jaitley handed over the Long-Range Surface-to-Air Missile (LRSAM) jointly developed by India and Israel, to the Indian Navy at Bharat Dynamics Limited. 2. India and Germany entered into a pact to improve parameters for grid integration of renewable energies. 3. Prime Minister Narendra Modi dedicated to the nation 11 completed highway projects in Rajasthan, covering a total length of about 873 kilometres. 4. J Thulasidharan has been elected as president of Indian Cotton Federation for 2017-18. 5. Ministry of Youth Affairs and sports has launched Sports Talent Search Portal to spot the best talent from among the young population of the country. The portal was launched by the Vice President of India M. Venkaiah Naidu at the Indira Gandhi Stadium in New Delhi. 6. Digital payments startup Paytm has rebranded its postcard service to Lifafa, a digital version of gifting money on festive occasions. 7. Chinese President Xi Jinping has appointed 63-year-old decorated General Li Zuocheng, a veteran of the Sino-Vietnamese war, as the new chief of the Joint Staff Department of the People’s Liberation Army (PLA). 8. According to a report by leading International Property Consultant Knight Frank, Mumbai, Bengaluru and New Delhi have been among the top six cities in the case of commercial location rentals during April-June 2017.